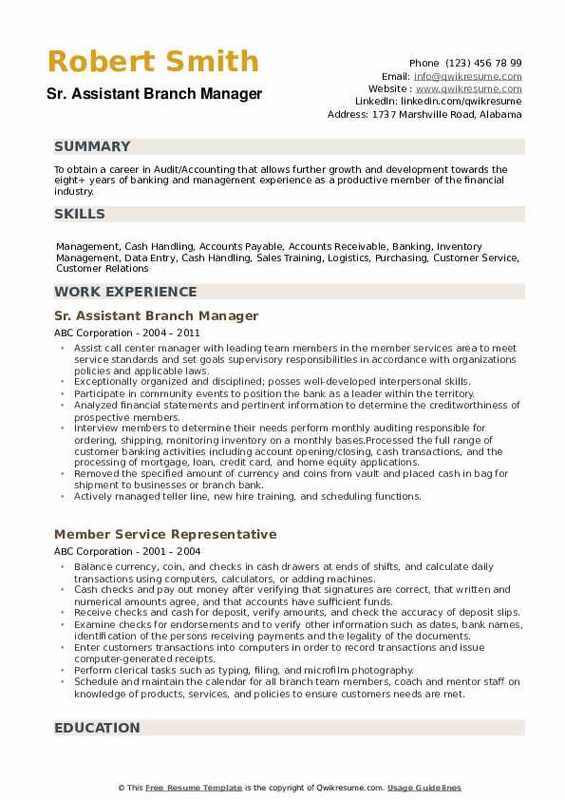 Assistant Branch Managers assist and support the Branch Manager so as to meet the branch goals. 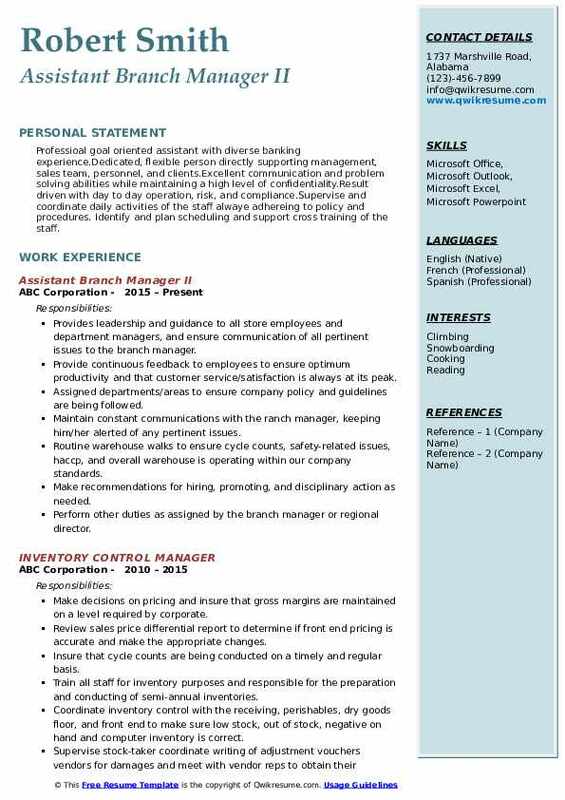 Responsibilities listed typically on the Assistant Branch Manager Resume falls nothing short of the following – supervising and motivating employees, overseeing operations, ensuring office operations by complying with the standard rules and regulations, implementing safety procedures, maintaining a good relationship with customers and monitoring sales of the company. Key skills expected from candidates applying for this post include –proven work experience, working knowledge of modern management procedures and techniques, familiarity with related software, knowledge of safety rules and regulations, result-oriented approach, leadership and human resource management skills. 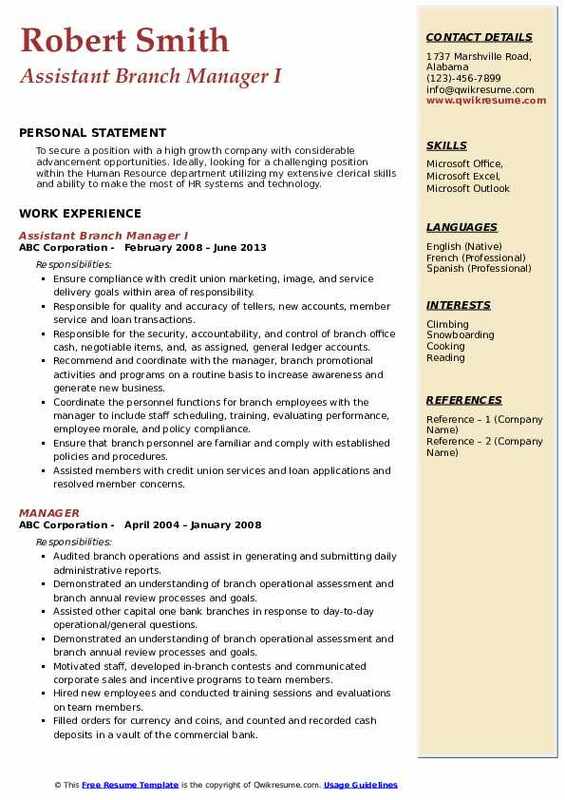 Most of the assistant branch managers mention in the resume a degree in the field of business administration or the similar along with relevant experience. 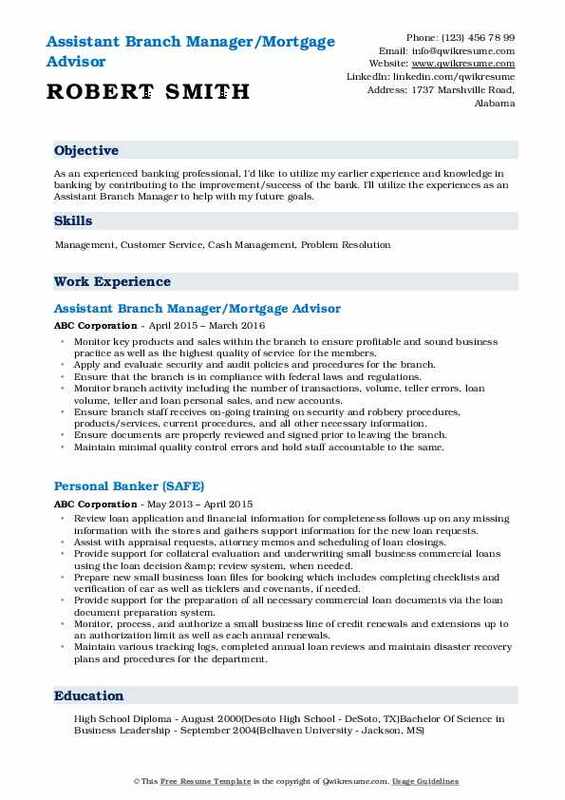 Summary : Highly motivated Branch Management Professional with years of experience in Banking. 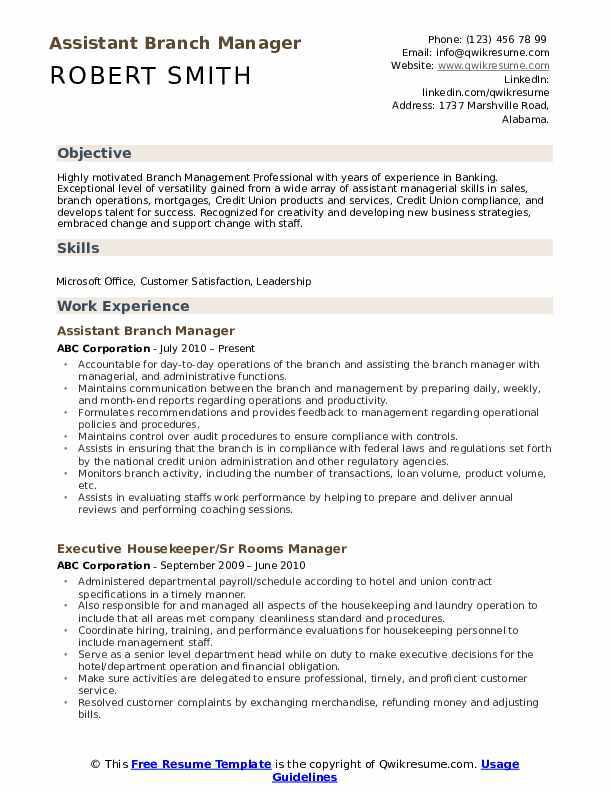 Exceptional level of versatility gained from a wide array of assistant managerial skills in sales, branch operations, mortgages, Credit Union products and services, Credit Union compliance, and develops talent for success. Recognized for creativity and developing new business strategies, embraced change and support change with staff. Accountable for day-to-day operations of the branch and assisting the branch manager with managerial, and administrative functions. Maintains communication between the branch and management by preparing daily, weekly, and month-end reports regarding operations and productivity. Formulates recommendations and provides feedback to management regarding operational policies and procedures. Maintains control over audit procedures to ensure compliance with controls. Assists in ensuring that the branch is in compliance with federal laws and regulations set forth by the national credit union administration and other regulatory agencies. Monitors branch activity, including the number of transactions, loan volume, product volume, etc. Assists in evaluating staff's work performance by helping to prepare and deliver annual reviews and performing coaching sessions. Summary : Dependable Manager bringing experience and a willingness to take on added responsibility to meet tight deadlines. Enthusiastic team player with a strong work ethic and advanced complex problem solving skills. Inspected and analyzed the financial operations and practices to develop and maintain more effective structures to provide more efficient responses to inquiries from staff, management, and clients. Performed random audits to monitor possible internal and external frauds, and suspicious activities. Routinely conducted interviews, reviewed documents, and administered coaching concerning the audit controls and processes. Enforced regulatory compliance, internal policies and procedures, and improved audit standards. Maintained updated monthly and quarterly reports for the branch concerning productivity and performance. Coached, motivated, and managed to create a climate that supported diversity and high employee retention by conducting timely disciplinary actions, terminations, and code of conduct violation. Evaluated performance and implemented actions to improve priorities, productivity, and exceed customer expectations. Objective : Highly effective management professional emphasizing innovation and creativity in solving complex problems. Energetic and results-focused with success in developing and leading diverse teams to achieve outstanding results. Forecasted, planned and executed branch strategies on a monthly basis to accomplish profitably goals. Delivered employee performance updates to upper management and processed reviews of employees to highlight successes and opportunities for growth. Processed weekly and monthly profit and expense reports pertaining to the branch sales goals. Created, implemented and managed both inside and outside sales plans to capitalize on current and new business opportunities. Developed a strong sales culture within the branch to capitalize on per unit additional revenue. Reduced and controlled branch expenses by monitoring and following up on receivables and managing employee hours. Responded to customer inquiries in a timely manner and seek completely satisfying results. Established personal and business member relationships, and managed ongoing product and servicing relationships with all members in personal and branch profile. Summary : Professioal goal oriented assistant with diverse banking experience.Dedicated, flexible person directly supporting management, sales team, personnel, and clients.Excellent communication and problem solving abilities while maintaining a high level of confidentiality.Result driven with day to day operation, risk, and compliance.Supervise and coordinate daily activities of the staff alwaye adhereing to policy and procedures. Identify and plan scheduling and support cross training of the staff. Provides leadership and guidance to all store employees and department managers, and ensure communication of all pertinent issues to the branch manager. Provide continuous feedback to employees to ensure optimum productivity and that customer service/satisfaction is always at its peak. Assigned departments/areas to ensure company policy and guidelines are being followed. Maintain constant communications with the ranch manager, keeping him/her alerted of any pertinent issues. Routine warehouse walks to ensure cycle counts, safety-related issues, haccp, and overall warehouse is operating within our company standards. Make recommendations for hiring, promoting, and disciplinary action as needed. Perform other duties as assigned by the branch manager or regional director. Support branch to achieve sales and profitability goals by deepening book of business through cross sale of products and services, partnering with specialists and acquiring new consumer and commercial client relationships. Objective : As an experienced banking professional, I'd like to utilize my earlier experience and knowledge in banking by contributing to the improvement/success of the bank. I'll utilize the experiences as an Assistant Branch Manager to help with my future goals. Monitor key products and sales within the branch to ensure profitable and sound business practice as well as the highest quality of service for the members. 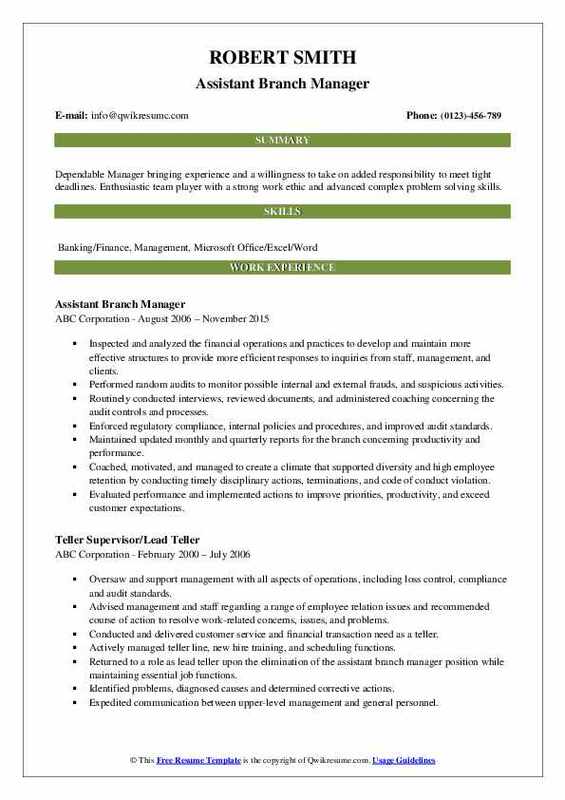 Apply and evaluate security and audit policies and procedures for the branch. Ensure that the branch is in compliance with federal laws and regulations. Monitor branch activity including the number of transactions, volume, teller errors, loan volume, teller and loan personal sales, and new accounts. Ensure branch staff receives on-going training on security and robbery procedures, products/services, current procedures, and all other necessary information. Ensure documents are properly reviewed and signed prior to leaving the branch. Maintain minimal quality control errors and hold staff accountable to the same. Managed daily turn around and underwriting process on loans and lines of credit for both personal and business members. Supervise customer service representative in the collection and maintenance of confidential financial information. 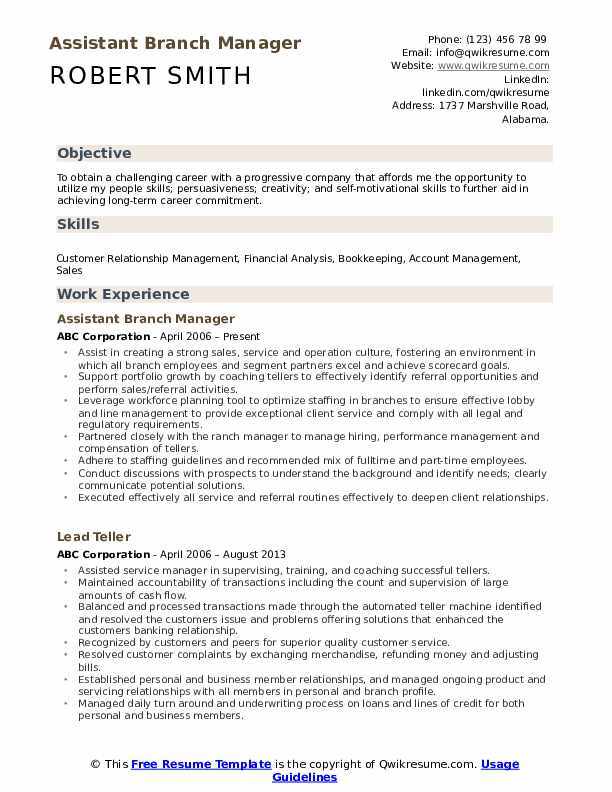 Headline : To obtain a position in an organization that enhances my skills and knowledge in customer service, administration and organizational leadership.Additionally I will provide experience and educational knowledge in the field of sociology and clinical counseling that can help contribute to the overall success of the company. 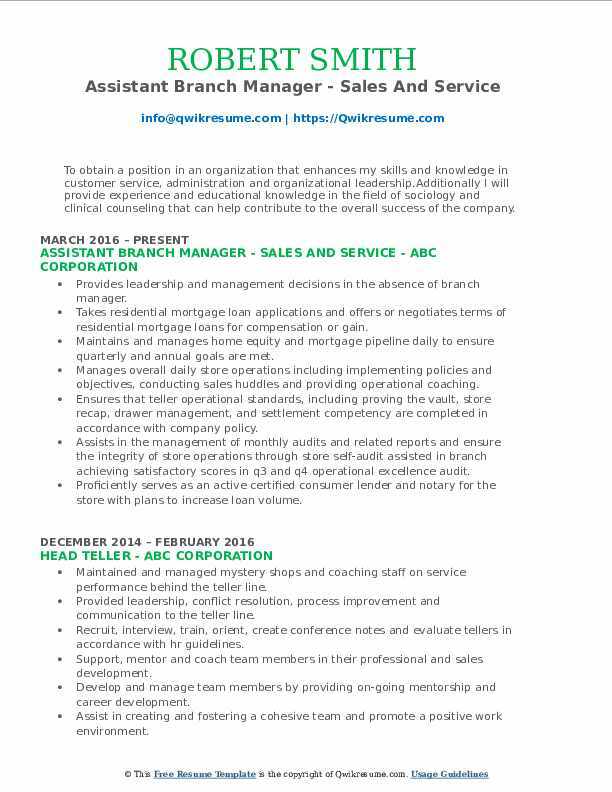 Provides leadership and management decisions in the absence of branch manager. Takes residential mortgage loan applications and offers or negotiates terms of residential mortgage loans for compensation or gain. Maintains and manages home equity and mortgage pipeline daily to ensure quarterly and annual goals are met. Manages overall daily store operations including implementing policies and objectives, conducting sales huddles and providing operational coaching. Ensures that teller operational standards, including proving the vault, store recap, drawer management, and settlement competency are completed in accordance with company policy. Assists in the management of monthly audits and related reports and ensure the integrity of store operations through store self-audit assisted in branch achieving satisfactory scores in q3 and q4 operational excellence audit. Proficiently serves as an active certified consumer lender and notary for the store with plans to increase loan volume. Summary : A committed and passionate professional seeks position to apply newly acquired skills from recently completed bachelors program in business management. Skilled in designing and implementing creative solutions to overcome challenges and advance organizational goals. Motivated and enthusiastic team player that takes ownership to deliver successful results. Skills : Quick Learner, Organized Multitasker, Customer-Oriented, Excellent Communication, Critical Thinking, Encourage Promotion, Increase Sales, Inventory Management, Follow Procedures. Establish subordinates working schedule, monitor timekeeping hours and variations to schedule. Coach, counsel, and as necessary, corrective action to ensure expectations are clear and employees are working towards established goals. Support and communicate relevant company information, policies and procedures to protect branch against fraudulent activity and unnecessary risk exposure. Demonstrated proficiency in banking operations, accounting, teller and platform operations/supervision. Excellent ability to interface and work collaboratively with a wide variety of constituents while effectively prioritizing and managing competing demands. Organized, flexible professional with the ability to analyze and make intuitive, problem-solving decisions. Strong technical ability combined with excellent communication and CSR skills. Prepared back office daily report of business by analyzing and categorizing sales information. 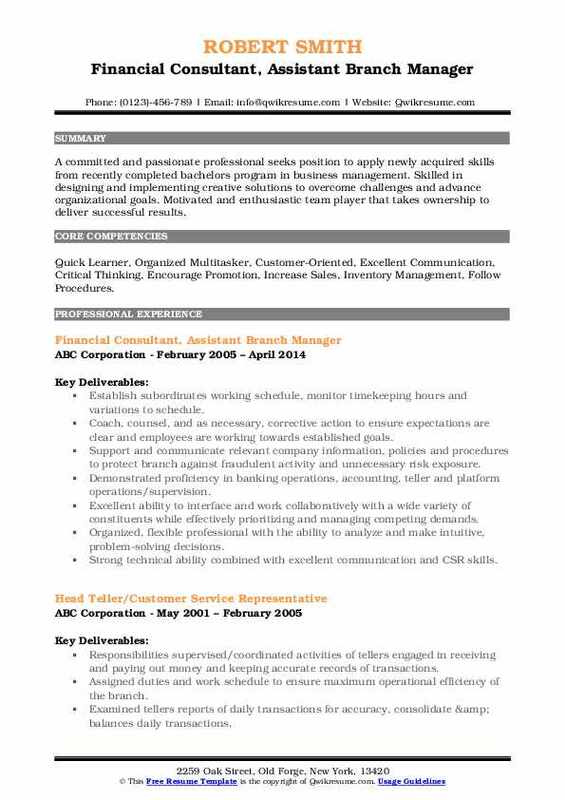 Summary : To secure a position with a high growth company with considerable advancement opportunities. Ideally, looking for a challenging position within the Human Resource department utilizing my extensive clerical skills and ability to make the most of HR systems and technology. Ensure compliance with credit union marketing, image, and service delivery goals within area of responsibility. Responsible for quality and accuracy of tellers, new accounts, member service and loan transactions. Responsible for the security, accountability, and control of branch office cash, negotiable items, and, as assigned, general ledger accounts. Recommend and coordinate with the manager, branch promotional activities and programs on a routine basis to increase awareness and generate new business. Coordinate the personnel functions for branch employees with the manager to include staff scheduling, training, evaluating performance, employee morale, and policy compliance. Ensure that branch personnel are familiar and comply with established policies and procedures. Assisted members with credit union services and loan applications and resolved member concerns. Summary : To obtain a career in Audit/Accounting that allows further growth and development towards the eight+ years of banking and management experience as a productive member of the financial industry. Assist call center manager with leading team members in the member services area to meet service standards and set goals supervisory responsibilities in accordance with organizations policies and applicable laws. Exceptionally organized and disciplined; posses well-developed interpersonal skills. Participate in community events to position the bank as a leader within the territory. Analyzed financial statements and pertinent information to determine the creditworthiness of prospective members. Interview members to determine their needs perform monthly auditing responsible for ordering, shipping, monitoring inventory on a monthly bases. Processed the full range of customer banking activities including account opening/closing, cash transactions, and the processing of mortgage, loan, credit card, and home equity applications. Removed the specified amount of currency and coins from vault and placed cash in bag for shipment to businesses or branch bank. 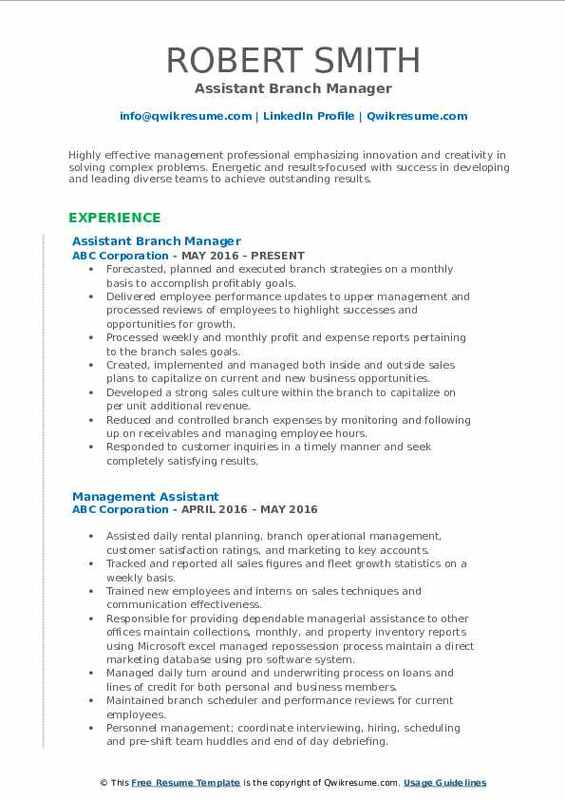 Actively managed teller line, new hire training, and scheduling functions. Summary : To obtain a challenging career with a progressive company that affords me the opportunity to utilize my people skills; persuasiveness; creativity; and self-motivational skills to further aid in achieving long-term career commitment. Assist in creating a strong sales, service and operation culture, fostering an environment in which all branch employees and segment partners excel and achieve scorecard goals. Support portfolio growth by coaching tellers to effectively identify referral opportunities and perform sales/referral activities. Leverage workforce planning tool to optimize staffing in branches to ensure effective lobby and line management to provide exceptional client service and comply with all legal and regulatory requirements. Partnered closely with the ranch manager to manage hiring, performance management and compensation of tellers. Adhere to staffing guidelines and recommended mix of fulltime and part-time employees. Conduct discussions with prospects to understand the background and identify needs; clearly communicate potential solutions. Executed effectively all service and referral routines effectively to deepen client relationships.